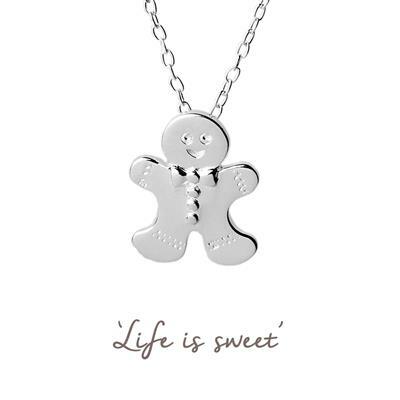 We love this cheeky gingerbread man from the mantra collection, full of festive joy and positivity. Made from 925 Sterling Silver and hanging on a 16 inch chain, wear this necklace to remind you of the joy of the festive season. At times it can be a stressful event but let the gingerbread man steer you into positivity! As part of our ten year anniversary we've created our first own brand line, Mantra. Combining beautiful designs with thoughtful meanings, the Mantra collection is inspired by the power of positive affirmations. Wear your Mantra necklace as a reminder of the power of positive thought and let the powerful words heighten your mood and awareness. Mantra jewellery comes packaged in a beautiful envelope featuring the Mantra logo, a clear area at the back with space for a personal message and sits on an iconic Mantra card. The perfect gift for someone special or a fabulous treat for yourself. What's your Mantra? FREE UK STANDARD DELIVERY ON ALL ORDERS. When you place an order with fabulous, we will get it to you as quickly as we can, and as securely as we can. You will see a dispatch estimate next to the product in green. As soon as we receive your order, we will email you with a delivery estimate if it is not in stock. If the item is in stock, we will despatch it the same or next day. If you need something urgently please pay for Next Day Delivery, or if it's for a particular deadline, call us on 0845 4509334 Monday to Friday 9am to 5.30pm and we will check stock availability for you. Delivery of all orders within the UK is free. •Orders up to the value of £30 are sent by Royal Mail 1st class post. •Orders from £30 to £99 in value are sent by Royal Mail Recorded Delivery, a signed for delivery service. •Orders of more than £100 are sent by Special Delivery, a signed for delivery service guaranteed to arrive next working-day. Overseas orders are sent via Royal Mail Airsure, for a flat rate of £8 postage and packaging to Europe, and £10 to the rest of the world. We regret that orders of over £600 cannot be sent overseas. We offer a collect in store service for customers who live locally to our shops in Leamington Spa, Solihull and Bath. So if you're shopping online and would prefer to collect your items from us, all you have to do is specify the relevant delivery option at checkout and we will hold your order for you in that shop. Please wait for an email to confirm your product is in your store of choice before going to collect it. If you change your mind about a product, we are happy to offer you an exchange or refund, provided you return the goods in the same condition in which you purchased them, in the original packaging, and with your receipt, within 14 days of the goods being received. If you wish to return goods* purchased online please return items in their original packaging, securely and protectively packaged, to: fabulous, 20 Lower Mall, Royal Priors Centre, Leamington Spa, CV32 4XU, UK. fabulous cannot take responsibility for returned items which do not reach us, or which arrive damaged, so we strongly suggest you send returned goods via Royal Mail Special Delivery or similar secure, insured method. fabulous does not refund postage costs. If you have purchased the items in the store, please bring them back in their original packaging, along with your receipt, in the same condition in which you purchased them, and we will happily exchange your items for something else more suitable or give you a credit note for the value of the goods (valid for 12 months), provided you return the items within 28 days of purchase. If you would prefer a full refund in the event that there is nothing suitable is available, items must be returned within 14 days of purchase, with your receipt. Unfortunately, we cannot give refunds for goods which are in our Sale (or 'Last Chance' items), when bought in-store, but will be happy to exchange them for another item. If you have purchased something in the sale online which you change your mind about, please contact us within 14 days and we will arrange for a credit note or refund to be issued as long as they are returned in the same condition in which they were sent. Any bespoke items ordered through fabulous, i.e. engraved items or made to order are exempt from the 'cooling off' period in the distance selling regulations. So please double check your instructions at the checkout. All faulty goods will be repaired in the first instance, replaced or refunded in the event that a replacement is not available. Refunds will be made in the same method of payment used for the purchase. When you place an order with us via our website, your name will automatically be added to our database, and you will receive our regular email newsletter telling you about new products. To unsubscribe to this, simply click the 'Unsubscribe' button on the first edition which you receive, and you will be removed from our mailing list. fabulous Gift Cards are available in-store and online, in any denomination between £5 and £500. Gift Cards can be used as a method of payment for goods in-store or at a fabulous event, or can be set up by fabulous as an on-line code. They cannot be exchanged for cash or credit notes, and cease to be valid 12 months after issue. fabulous reserves the right to decline to accept cards it believes to be forgeries. fabulous runs a Privileged Customer scheme available to customers who have spent £300 or more with us, and joined our Mailing List. For full details of the Privilege Scheme, please visit the Privilege Page. fabulous is a trading name of Fabulous Collections Ltd. Any attempts to copy or imitate fabulous in a way deemed to be an infringement of copyright will be dealt with seriously.